ABBA “tribute” acts will have to report the track lists of every public performance they give, under strict new criteria issued to the bands by Universal Music in Sweden. Last month, The Stage revealed exclusively that a number of ABBA tribute groups had been issued with legal notices from the record company asking that they change their band names. It stated that Universal believed their names constituted an infringement of its intellectual property rights. Following this, in emails sent to tribute bands and seen by The Stage, Universal stated that ABBA could be associated with the tribute acts providing that four criteria are met. These are that the word ABBA is always displayed with the word “tribute” and these words are in a smaller font size than the band’s name, that no ABBA pictures are used in marketing material, that the tribute act does not produce merchandise that has ABBA pictures or covers on it and that the band reports track-lists of the songs performed in their set after every gig. Universal Music started by contacting 15 tribute acts. 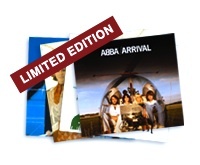 It is understood that it plans to contact all the tribute acts that it believes infringe the ABBA trademark. A spokesman for Swede Dreamz – one of the bands initially contacted by Universal – confirmed that it had made the changes requested on its website and, as ABBA does not feature in the band’s name, the band “found it was easy to comply with Universal Music’s request”. A spokesman for Universal Music in Sweden said it had no comment on the development. ABBA 2011 Calendar + Stickers. The latest of next years ABBA celendars is now available. This one features curiosities on the back of each month along with the 12 Stickers on the back page. Buy it here. Comments : Comments Off on ABBA 2011 Calendar + Stickers. LIMITED EDITION ORIGINAL LP BOX SET! Due for release late 2010. Mamma Mia! Leave them wanting more. Comments : Comments Off on Mamma Mia! Leave them wanting more. Abba-look at the latest issues of Aussie Gay mag DNA. ABBA make a mention on the front cover! Kylie Minogue’s new album is out today. The book gives fans a uniquely hands-on experience, ABBA Treasures showcases 20 pieces of removable memorabilia, including reproductions of collectible stickers and trading cards, a backstage pass, tickets, the souvenir program from their 1979 world tour, and much more. With more than 150 photos. The author is Elisabeth Vincentelli who also wrote ABBA s “ABBA Gold”, published in 2004. She is the chief drama critic at the New York Post, and previously worked at Time Out New York, first as the music editor and then as the arts & entertainment editor. Her music writing has appeared in the anthologies The Rolling Stone Encyclopaedia of Rock & Roll and Best Music Writing of 2007, as well as Rolling Stone, The New York Times, Entertainment Weekly, The Village Voice, Slate, and The Believer, among others.